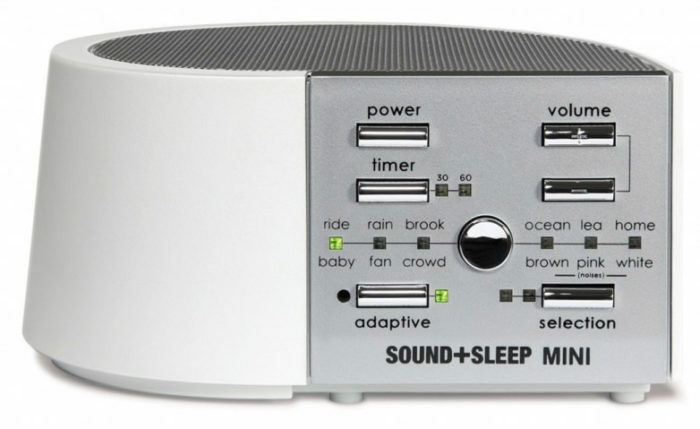 SOUND+SLEEP Mini – Smaller in size, but not features. Buy your Sound+Sleep Mini now in our online shop! Free UK shipping and satisfaction guaranteed! Having trouble falling asleep in unfamiliar environments, or are noisy hotel rooms an issue? Getting a good night’s rest is one of the best ways to overcome jet lag, and it’s why we created the Sound+Sleep MINI. At just 4.5 inches wide and 6 inches long, it easily fits into your luggage. It’s powered by four included AA batteries, AC wall power, or a powered USB port. A built-in computer and microphone continuously “listen” for intruding noises such as barking dogs, automobiles, overhead airplanes, or loud roommates. In Adaptive Mode, the unit dynamically adds sounds to the SoundStory and automatically adjusts volume to offer superior sound masking or neutralizing capabilities. All that’s left to hear is a soothing natural sound that minimizes disruptions that disturb or interrupt sleep. As intrusive noises subside, the unit gradually and automatically returns to normal playback settings. Sound and “white noise” machines have long been used to help people mask unwanted background noise. However, even leading brands fail to use the latest audio software and technology. Although more people are attuned to high-quality audio from experience with MP3 and CD audio players, home theaters and PCs with external speakers or headphones, sound machines largely ignore improvements in case design, speakers and other components that can provide the quality people now expect from audio products. Unlike competing sound machines, the SOUND+SLEEP product family plays high-quality, lengthy, and primarily natural sound recordings. This reduces the annoying repetition of short sounds and the irritation of poor-quality, short or synthesized recordings that can actually raise stress and disrupt sleep. Each SoundStory has a library of dozens of enhancing sounds. The “Richness” setting determines how many sounds are added to augment the base SoundStory. Real-time variations introduced when Richness is increased make each SoundStory seem nearly infinite in length. Features like the ability to turn Adaptive Mode OFF and ON; sleep timers with automatic, gradual off; and the ability to turn display lights off make ideal for nighttime use. SOUND+SLEEP and nomad leverage over fifteen years of research and breakthrough patents for its Adaptive Sound™ technology. The SOUND+SLEEP family are simply the best and highest quality sound machines available today. 12 audio programs, here’s a few. The SOUND+SLEEP Sound Profiles are implemented with ASTI’s proprietary SoundStory technology. Each SOUND+SLEEP SoundStory is recorded the hard way. Our sound engineering and design teams climb trees, sit up all night waiting for frogs to croak, and stand outside in thunder storms with high-quality sound equipment to capture the best quality sounds – the authentic sounds of nature. All of our SoundStories employ recorded natural sounds except for the Meditation and White Noise themes. Each ASTI SoundStory is a blend of a foundational theme enhanced by an extensive library of additional natural sounds. For example, the Rainfall SoundStory is augmented by various thunderclaps, wind sounds and more. SOUND+SLEEP measures the ambient sound in a room using its built-in microphone to determine the appropriate mix of sounds to play. ASTI calls this real-time sound composition. Many other machines we’ve tested have recordings as short as just a few seconds. When there is a sound that briefly repeats over and over again, it can actually become irritating — keeping you awake rather than helping relaxation and sleep. SOUND+SLEEP recordings are longer than any competing sound machine and have hundreds of enhancing sounds that are randomly and algorithmically mixed into the base sound story in real time.